The first part of an EPD calculation requires phenotypic records. These are the records that have been discussed before such as growth traits, ultrasound scan traits and anything else that is recorded. Without these records there is no way to proceed with a genetic evaluation and calculate EPDs. It is also very important to keep these records on all animals in order to provide more data that provides for better evaluation and comparison between the animals. These records should all be taken in groups so that there is a means of comparing. This leads to another portion of EPD calculations, which is contemporary groups. Contemporary groups are important because they allow for animals to be compared to other animals that are raised in a similar environment. Contemporary groups are formed for birth weight by when a calf is born and where. Then weaning weight contemporary groups are formed by the weaning group and these groups stay together through yearling weight and scan data. Animals can be taken from the weaning group before yearling weight, but cannot be added. To calculate EPDs the differences within the group are used. This is another reason it is important to record all animals until they are culled. Recording only certain animals creates biased data and does not give as much credit to high performing animals. The other part of the EPD equation is the animal’s relatedness to other animals in the evaluation. 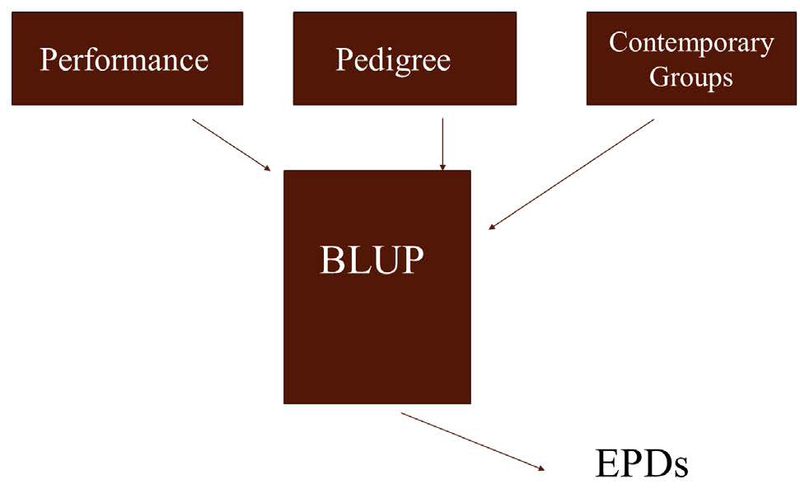 This step is done by analyzing the enormous pedigree file of the breed and seeing how related any two animals are based solely on a pedigree estimate. Relatedness seems simple, half from the sire and half from the dam, but in a breed all animals are related in some way and animals can be more related to one relative than to another. Knowing how related animals perform and how related they are is used in the calculation of EPDs. EPDs are calculated twice a year for Beefmaster Breeders United, once in the spring and once in the fall. In-between evaluations the association has implemented Interim EPDs or “I” for animals that are not included in the evaluation. Animals that are registered and have data recorded between evaluations will receive Interims (I), which are more accurate than a pedigree estimate (PE) since they take into account an individual’s performance in a contemporary group. The equation for calculating interims is I= ½ Sire EPD + ½ Dam EPD + ½ Mendelian Sampling Effect. These Interim EPDs will be replaced with actual EPDs after a genetic evaluation is finished. These are the very basics to EPD calculation. EPDs help to provide an unbiased prediction of how an animal’s progeny will perform based on phenotypic records, pedigree and contemporary groups. EPDs are a tool that producers can use to improve and continue to move forward with their breeding decisions. In the next article I will discuss the use of EPDs. How does 1/2 + 1/2 + 1/2 = 1 ? It is the sum effect of the contributions for each the sire, dam, and mendelian sampling effect to the animal’s interim EPD. The goal of this is not to equal one. For example, if the sire value is 20, the dam value is 30, and the mendelian sampling effect is 20 then the Interim = (1/2*20) + (1/2*30) + (1/2*20) = 35. If I am at a party and 3 people offer me ½ of their pizza, but each person’s pizza is a different size. I don’t end up with 1 ½ pizzas, I end up with the total sum of the different portions from the three people. Good comparison example with the pizza.